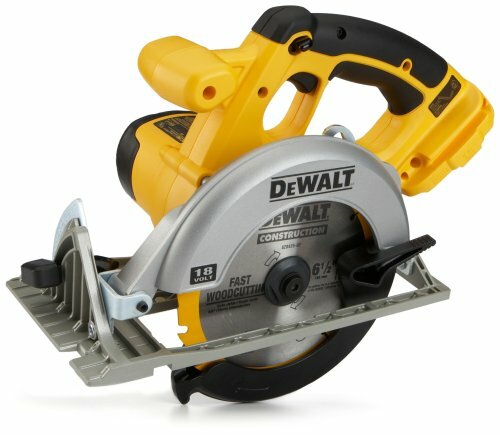 Featuring a beefy 18-volt motor, Circular Saw cuts over one hundred 2-by-4's on a single charge. The blade is located on the left side for better visibility and has a spindle lock for easy changes. The motor is fan-cooled and has replaceable brushes for increased durability. With a maximum of 3,700 rpm, this circular saw can finish large projects in no time. The shoe bevels to 50 degrees, and the 6-1/2-inch blade can cut 2-inch material at 45 degrees. What a gem! Light weight, maneuverable, easy to use & a REAL BARGAIN! Can't figure out what all the problems other people are having with the safety button? I find it a breeze to use. I guess one should read the whole description on the item before buying it & you'll see in plain English TOOL ONLY! This unit is plenty tough enough to do jobsite duty. Just keep a spare battery charged up & you won't have any problems. 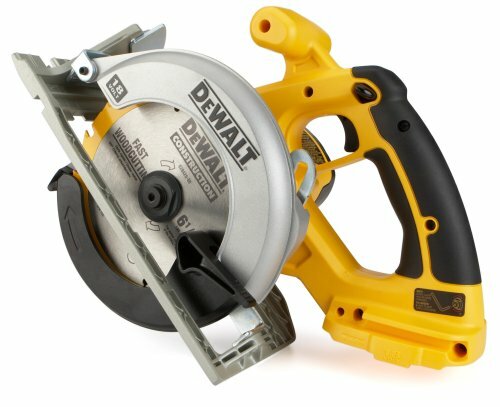 I bought one of these, new with DeWalt blade, on eBay for $60 delivered. I already have four 18v batteries, so I needed none of those. I was a bit shocked to see that it comes with a plastic blade guard. Since that's what the saw rests on when you put it down, it is not likely to last long. The safety switch is awkward to use. The general heft and feel of the thing is not up to the quality of my three DeWalt drills. 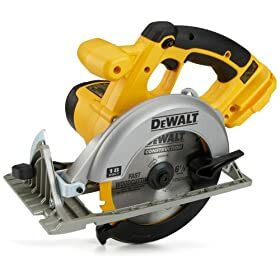 It works well enough for a light duty saw and it is worth about what I paid for it, so I'm satisfied with the purchase, but just a little disppointed with the fall-off in DeWalt quality. I recently upgraded to a Dewalt 18V drill, so I bought this bare saw to go with it. I just spent a good part of the weekend building a deck and stairs for my spa. This saw rocks. Very light, very easy to handle both right and left handed. The trigger safety is an easy reach. I can't say enough good things about this saw. This was cheaper than local hardware stores. Light and easy to use. My husband loves it for smaller jobs. Pros: I like this saw more than I thought; it has very good power, very smooth operation and goes a long way on one battery. The deck is quality aluminum and very easy to adjust. It is nicely balanced even though the battery is probably half of the weight. Cons: The trigger and safety switch are too close together for large hands. Also with the trigger pulled there is a gap in the handle that digs into my finger; especially during long cuts or prolonged use...this is probably exaggerated because of the angle my finger is at on the trigger when flexing to release the safety switch with my thumb. It was annoying enough that I started wearing a glove when operating this saw for more than short cuts. Overview: The quality of this saw makes up for the trigger issue I have with it. And as with all my Dewalt reviews, my 11 Dewalt tools (and growing) on one battery platform makes Dewalt 5 stars over all. I marked this saw down but that shouldn't discourage anyone from purchasing it. This saw is an exceptional value. I found other places for well over a $100.00. The saw was shipped when they said it would and it arrived on time. I buy from these folks again. Love the saw and the concept of bare tool. Big deal was made of the fact that batteries do not come with the saw. Read the reviews and looked at the pictures prior to ordering and was convinced that blades came with the saw. WRONG. Just be forewarned; order blades with the bare tool. This is an amazing bare-tool saw. Purchased it from Tool King In march, 2009 and glad i did. If you are looking for a great bargin on cordless tools i suggest purchasing them from Tool King, plus they give you excellent service. How many chargers do you need? Bare tools are the way to go! I'm a DIY'er and ordered this unit because it was compatible with the 18V drill/batteries/charger I already had. I love the "tool only" option. It works nice under normal use, is balanced and light. Since I have two batteries, I always have a full and ready charge. I can cut through 2"x4"'s like butter and I was impressed with it ripping through a sheet of MDF. Much easier than pulling out the table saw for one or two long cuts without any help. I love the saw but it didn't include a blade. The Amazon description says "6-1/2" Carbide Tipped Blade for 2x Cutting Capacity at 90 and 45 Degrees". Also - It looks new, as advertised, but wasn't in a factory box; just a plastic bag in a off-the-shelf box. I'd still recommend it, just be sure to buy a blade. 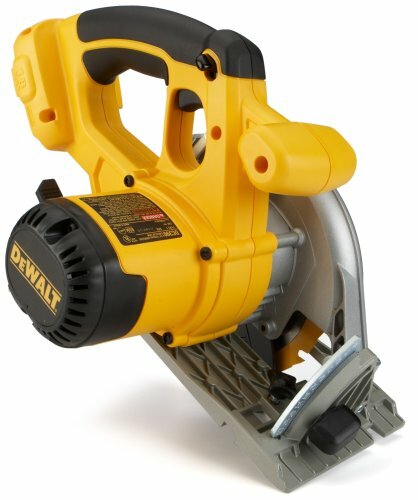 I work as a contractor, and have many different DeWalt XRP cordless tools. All of the others are excellent, but I ahve found this saw to be terribly balanced, with an awkward safety switch. Also, While it is OK for light framing use, the blade speed isn't hihg enough for any application that demands a clean cut. Overall, the tool is fairly handy, and I'm glad I glad i have it, since its a lot lighter than my Skilsaw, but this saw needs a serious redesign.